I am Rajani and I belong to Valli’s Blogging Marathon (BM) group. That has almost become my blogging identity! I have been part of this group for almost past two years (that’s over 3/4th of my blogging years). It’s a group of vibrant active bloggers. You can guess how active we are, when I tell you that this is the second Month Long Marathon of this year! April was the last one. The main theme for September is ‘A-Z’ – Alphabetical blogging. To make it more challenging, Valli had thrown in a choice of four themes into which the A-Z dishes should fit in. I am from Kerala and this month our biggest festival Onam, falls on Sep 16th. Its our harvest festival and people from Kerala celebrate it irrespective of religion they follow. What better way to celebrate it than to showcase recipes that will be featuring on the traditional feast! So, I bugged Valli to give me a special concession to feature Sadya recipes for this month. And yes, she accepted it. The recipes, again like today’s post, has to fit into the alphabetical theme as well. A Sadya is a vegetarian festive meal served on a banana leaf. It’s a speciality of Kerala (Tamil Nadu follows the feast closely, but it’s not called a Sadya). Sadya is served for occasions like weddings, house-warming ceremony, for birthdays and for regional festivals and most importantly for Onam. Keeping in mind that this is a 30 day marathon , I will write about Kerala, Onam and Sadya in some of the upcoming posts. Also keep in mind that I am not an expert, I am just sharing what I know. There is a huge region/religion influence on how the Sadya is prepared and served. Things differ from community to community and even from house to house. So this may not be what you follow or read somewhere else. Please share if you do something a different way! There are a lot of recipes that feature under the alphabet A, that can be served for a sadya. I chose three which were doable for me – Avial, Ada pradhaman and achinga payar-chena mezhukku puratti. Mezhukkupirattis don’t feature much in the Sadya, but my father said his mom used to make it and that was good enough for me. The first three posts were done when I was in Trivandrum. So for these days, I was an assistant cook and most of the cooking was done by my mother’s cook. For today’s post, she did the major cooking and my job was to assist with the payasam. Avial is a ‘must’ list for a sadya. Even a regular meal can be upgraded to a mini sadya by the addition of avial and payasam. 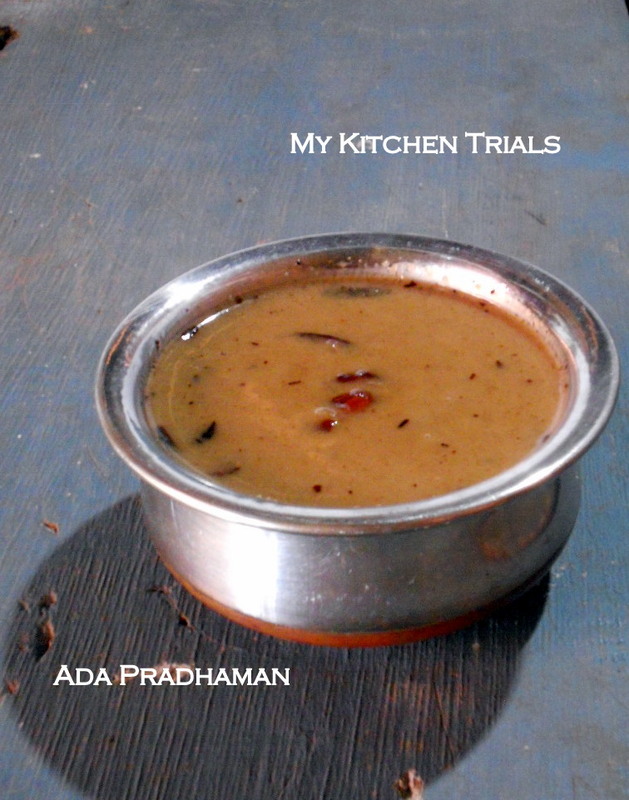 Ada pradhaman is one of the many payasams that can be prepared for Sadya. Consistency : This dish can be prepared dry or can be a bit runny (like here) or really watery (and served like a sambar on ordinary days). But for a sadya the consistency is usually dry or a bit runny. Some prefer the vegetables to be cooked/mashed thoroughly(this happens by mistake as well if you overcook the vegetables. It disintegrates when you boil them later), while other prefer the vegetables cooked, but yet retaining its shape. The choice of vegetables that goes into this dish, is different in different houses. Mostly ‘English vegetables’ are not used (carrot and beans are used though). 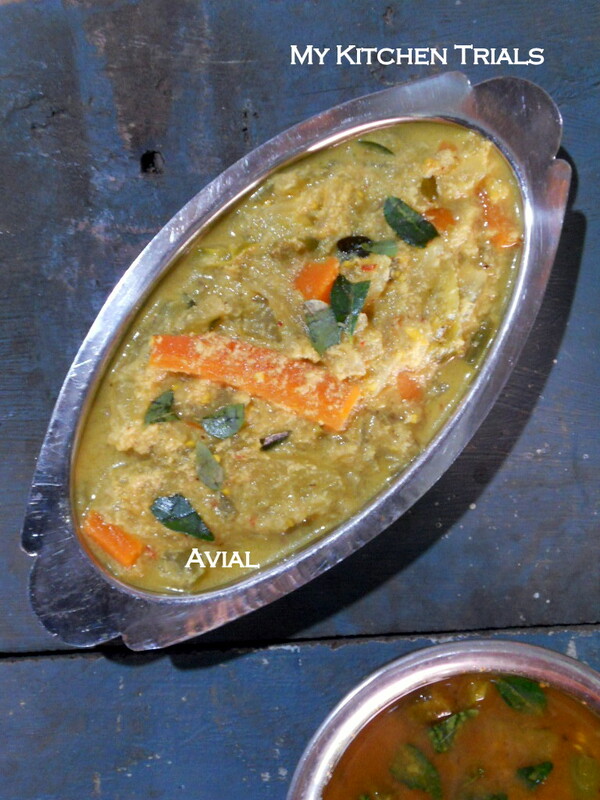 ‘Naadan vegetables’ (rough translation would be ‘native vegetables’ of Kerala) are preferred for making this dish. **The usual vegetables are a combination of Yam, Raw Bananas, Carrots, Ash Gourd, Cucumber, Beans (any variety of green beans – avarakka, kothavarakka etc are also used), Snake gourd, Brinjal, drumsticks. Raw mangoes are used sometimes (the souring agent -tamarind or yogurt is skipped if mangoes are added). Potatoes are added in Tamil Nadu, but not much in Kerala. **The authentic avial won’t have vegetables like cabbage, capsicum, radish, tomatoes, cauliflower and such. The vegetables are cut into French fries potatoes size and shape. No tadka is done for this, instead coconut oil is added as such in the end to the dish. Wash and clean the vegetables. Cut them into 2″ long rectangular pieces. Idea is to have same sized vegetables. In a pressure cooker, add the cut vegetables, two cups of water, turmeric powder and cook for two whistles. You can steam or microwave the vegetables as well. Skip the water and turmeric powder in that case. Grind the coconut, jeera and chillies into a coarse paste without adding too much of water. If you want the curry to be watery, then grind till the coconut is a fine paste. Once the vegetables are cooked and the pressure has dropped, transfer them to a big kadai. Again, you can retain all the water or drain off some portion or drain it off totally, depending on the consistency you want for the avial. I usually retain 1/2 cup of water at least. Remember that we are going to add the yogurt later (this will add some liquid to the curry). Bring the vegetables to a boil, add salt and the coconut paste. Let it cook for 4-5 minutes. You can stir in between to avoid burning, but be careful not to break the vegetables. Do a taste test and adjust the seasonings. Once everything is fine, add the yogurt, mix and let it boil for a minute and then take off the heat. Add about a tablespoon or two of coconut oil and a couple of sprigs of curry leaves to this. Cover and keep aside. Serve with rice. Payasam(kheer) is kind of a dessert. There is a small serving in the beginning, but it is served as a course itself towards the end of the sadya. The one presented here is the jaggery based payasam, you have a milk based one as well for this ada. The payasam will thicken after cooking too. So if its too thick at the time of serving, you can dilute with milk (not coconut milk). Coconut milk can be substituted with cow’s milk, though its done as a last resort. Bring 2 cups of water to a boil. Take off the heat, add the ada and keep aside for 15 min or until the ada is a bit soft to touch. This step is to precook the ada a bit. Drain. Extract coconut milk (I will be adding this post later) or use ready-made mix. Crumble/crush jaggery into small pieces. In a big heavy vessel, add the jaggery and enough water to cover it. Heat this, stirring now and then to avoid burning. We are trying to remove the impurities/dirt from jaggery. Once its melted completely, wait for it too cool a bit and drain using a muslin cloth or a sieve. If you are using a plastic sieve, wait until the jaggery is a bit cool or the mesh might melt. Bring the jaggery syrup to a boil again. Add the ada pieces. Stir now and then. Once it starts to thicken, add the thin coconut milk extract. Let it cook for 5 minutes, stirring frequently. Once the payasam is thick, add the thick coconut milk. Mix thoroughly and bring it to one single boil. Take off the heat and mix and keep aside. There is a chance of coconut milk splitting. So this step is always scary for me. Once the payasam is ready (it is done now!! ), in a small kadai, heat the ghee. Add the raisins, cashews and the coconut scrapes. Fry till golden. Pour on top of the ada pradhaman. Serve hot or cold in a glass. This is not a very common recipe for a sadya. In olden days (my father’s childhood days), most of the vegetables are homegrown. Houses had back yards and everyone would try to save by growing vegetables as much as they can. It was part of the lifestyle then. Spinach, yam, taro roots, coconut, bananas, mangoes were all home-grown. Coconut trees, banana plants and mango trees were abundant then in one’s own courtyard. So these produces feature a lot in their cooking as well. Chena/yam is a common thing and so is raw bananas. So there are a lot of recipes which feature these two veggies a lot, paired with coconut mostly. This mezhukkupiratti, a variety of long beans, paired with yam is a frequently made dish at my dad’s place. He tells me his mother used to serve it for sadyas as well. Mezhukkupiratti is a dish made without coconut. It’s almost a vegetable fry. Vegetables are sauteed and then covered and cooked with a bit of water. Usually, its rare to find mezhukkupirrati for a sadya as making mezhukkupirattis for a big group is a difficult task. It’s a lot easier to make the ‘thorans’ (dry vegetable dish with coconut). This is an amazing combination and now is a favorite of my husband. Cut the beans into long 1″ pieces. Keep aside. Heat 1-2 tbsp coconut oil (or oil of your choice ). Add the achinga payar/long beans and green chillies. Saute for a couple of minutes. Sprinkle a handful of water, then cover and let it cook for 4-5 minutes until the vegetables are done. You need to check it once in between and add more water, if required, to prevent it from sticking to the base of the pan. Once its 3/4th done, add the yam pieces and salt. Mix nicely and again cover and cook until its all cooked. You might have to sprinkle some more water and stir in between a couple of times. If at any point, the vegetables threaten to stick to the bottom of the kadai, sprinkle or add water in tablespoons. Remember that the finished dish shouldnt have any water in it. Do a taste test and adjust the seasonings. If its not spicy, you can add chilli powder/flakes as well. Take off the heat when the vegetables are completely cooked. Serve as a side dish for rice and sambar. super post Rajani… was missing ur humourous anecdotes all this while :-)) and am sure we wd find a treasure trove of Kerala / Onam recipes by the time Sep is gone..
Look fwd to more delicacies from ur end all this Sep ! Yes. This is a long post. And I loved reading through the whole of it. Hope you sustain enough energy to write-up posts like this through the month. The yam and long beans combination sounds so different. Got to really try it. Somehow feel I will really like it! Wow ! So much I have learned in this single post and all that work you did toady ! Great..
And loved reading your ‘This and that’ info..
Rajani, first things first! I loved your intro line..:)..I am so honored really. Now coming to the long post, well I think you must continue doing this as this was something I missed during your absence…so hope you are up to our demands. I enjoyed reading through them and I can see that we don’t have the avial without the tadka, should try all these sometime. Not sure if I have confessed, I am lover of kerala cuisine and can lap on them anytime..so bring them on! Awesome post Rajani..Loved every bit of it! I love it when the history and tradition behind the recipes is explained as it gives a perspective and context which definitely enhances the ‘divinity’ associated with the dish..I am so looking forward to the rest of the recipes! wow wow awesome dear :) sandya platter looks super delicious and am drooling badly :) you are rocking !! Amazing post Rajani with so much information. I’m sure by the end of this month, we will all be equipped with enough information to host Onam party of our own. Seems you r in full form Rajani, we have 25more posts to go re..Wat is this dont kill us with this fabulous spread, makes me hungry here. Great ones. 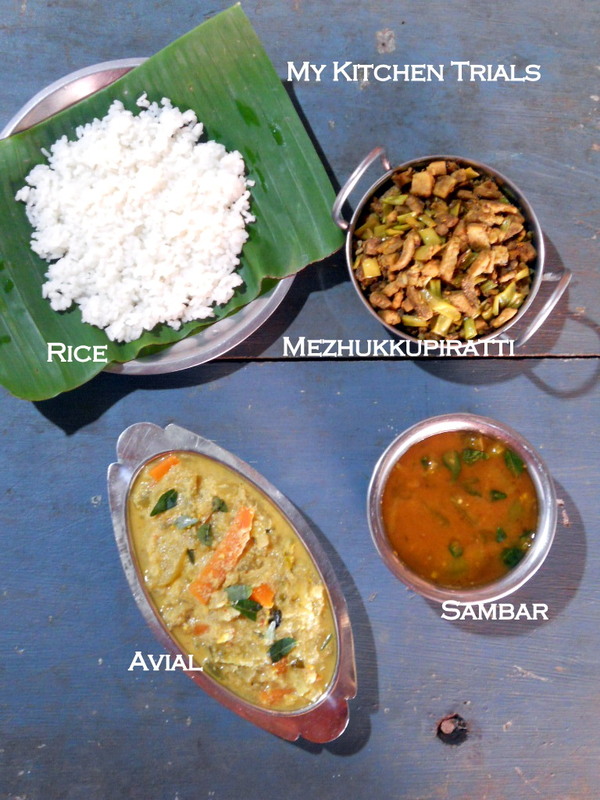 Looking forward to Kerala’s traditional dishes. Hoping to learn some thru this BM. 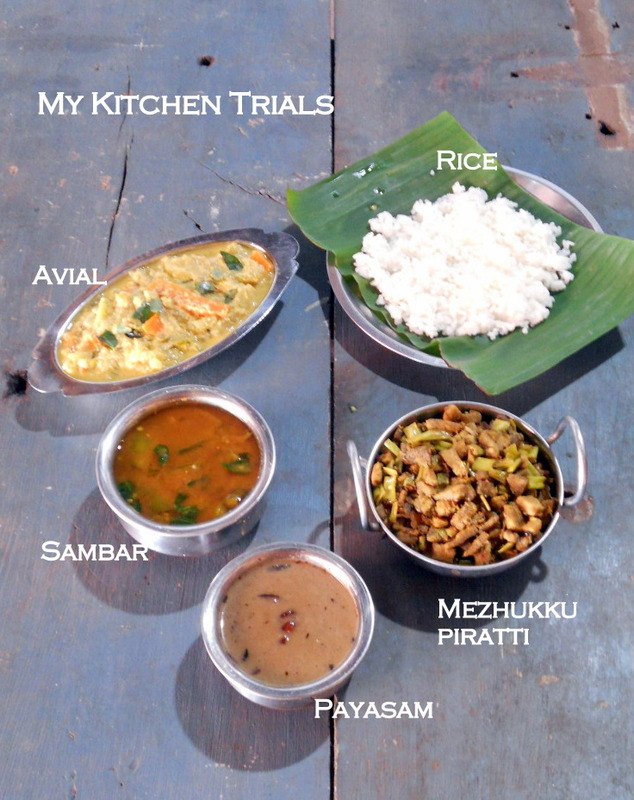 One lovely spread of recipes & Avial is one of my favorite recipe & also made often in my house… I was reading the post & wanted to mention that even in andhra A typical brahmin household follows something similar to sadya for festivals & marriages. Wow nice stuff long post but lovely effort love the menu it’s nice to see new recipes on this marathon. First time to ur place enjoyed reading it. Full treat of food very nice. What a treasure of knowledge about Sadya food. 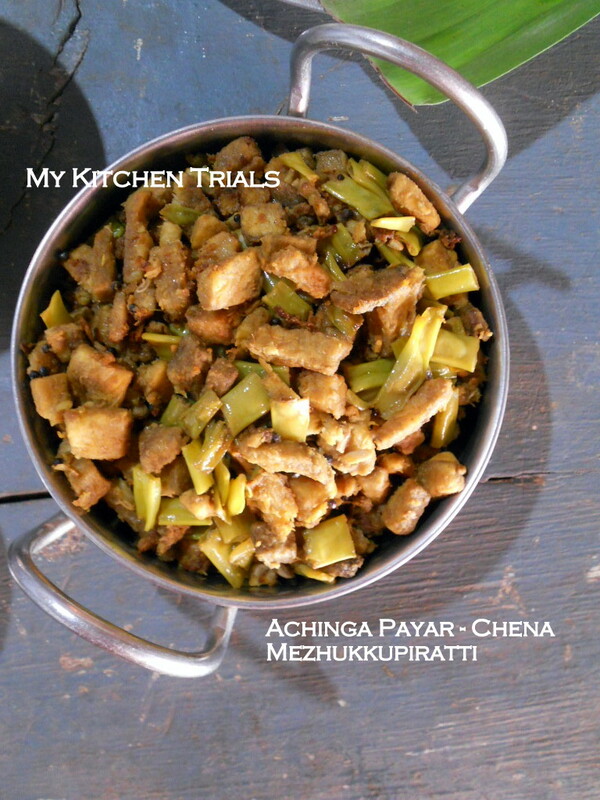 I love Kerala food and love Avial very much.. Will also try making Achinga payar – Chena Mezhukkupiratti as we grow both at home and have many varieties of beans available in winter. oh that is a beautifully written post… bookmarking them all!!!! Yes you are right we are fromBM group we can proudly say that no I agree with you… feel like having Avial now .. and that payar and chena combination is very new to me have to try that, pradaman looks so tempting but I like my pradaman with milk. superb post rajani. Rajani you rock. Wow what a post!!!!!! I knew only avail and the rest are all new. Even the avail that I had made was rubbish compared to what you have made. By the way what is “ada” I tried googling and not tooo happy. Kepp them coming gal ! I wish, I could invite myself to your place..Super sadya recipes..love these entire post..